Creamy Broccoli and Cheese Soup that’s quick, easy, and entirely from scratch! This homemade Panera Bread copycat is filling and flavorful and is always met with a request for seconds (and thirds!) by my family and friends. Last week I threatened promised that I’d share one last soup recipe from my soup-a-palooza recipe testing. You can pretend to be surprised, but I’m banking a few of you stopped by today for that very thing. The rest of you took off running. Come back I love you!!!! Since downing a big bowl of the stuff at Panera last week, I haven’t been able to get broccoli and cheese soup off my mind. It also happens to be one of Paul’s favorites and has been requested non-stop since the temperature began to drop outside. I did a quick google perusal of homemade broccoli cheddar soup recipes and almost fell over. Oodles and oodles of additive-rich canned cheddar soup, cream of broccoli soup, and an ever-present smorgasbord of velveeta “cheese product.” Oh the franken-foods! I nearly slid off my chair when the faux-cheesiest of them all had bajillions of 5 star reviews. Come on kids! We’re better than that! Speaking of eating real food, Panera Bread has a similar philosophy with their menu! Over the years I’ve tried their vegetarian black bean, their creamy tomato, and even their garden veggie soup with pesto. Of course my go-to will forever be the broccoli and cheddar. If I’m going to drive two towns over for soup, chances are that will be the one I get. Most of my girlfriends live an hour or so away so when our crazy schedules align we’ll meet at our half-way point to play catch-up and stuff our faces. The hardest part isn’t the drive… or the scheduling… Nope! The hardest part is not snorting soup through our noses while we laugh at each other. I won’t name any names, but I will give you soup! Creamy Broccoli and Cheese Soup that’s quick, easy, and entirely from scratch! This homemade Panera Bread copycat is filling and flavorful and is always met with a request for seconds [and thirds!] by my family and friends. It’s music to my ears! I made this soup 5 times. Five. This one was the BEST! Thick, creamy, cheesy, broccoli-y (pretend that’s a proper adjective!) and positively swoon-worthy. Not to throw my own confetti or anything. Hah! This soup is quick and easy (30 minutes or so and it’s good to go!) but I included uber-detailed instructions to help you out in the kitchen. Hopefully you don’t mind! Pinned over 800,000 times, this soup is a total crowd-favorite! Recipe yields 2 big bowls of broccoli and cheese soup or 4 cups of soup. Feel free to double the recipe as need - it's oh so easy to do and tastes amazing the next day! First ze veggies: Chop em! Dice the onions super small, mince the garlic, an shred the carrots if you didn't buy pre-shredded. This can all be done ahead of time and stored in the fridge for later. For the broccoli, chop 2/3 of it into tiny florets [just cut off as much stem as you can and it'll fall apart in the pot] and then take the remaining 1/3 and give it a rough chop so you have a few large pieces to add to the soup. Totally optional! Add your veggie broth to a pot on medium-high heat, add your 2/3 of your broccoli [about 2 cups of florets] as well as your onion, garlic, carrots, and bay leaf. Simmer on medium, covered, for about 15-20 minutes or until the veggies are tender. Once the broth is done, start your roux: In a large pot, melt 3 tablespoons of butter on medium heat, whisking constantly. Once melted, slowly add 3 tablespoons of flour as you continue to whisk. For a thicker soup, use an extra tablespoon of each. I skipped it. Remove from heat and slowly pour in the broth from your veggie mixture [its okay if some of the veggies jump in along side it!] and stir to incorporate. Next pour in the veggies and slowly stir in 1 cup of room temperature half and half. Return to the burner on very low heat, uncovered. Spoon out the bay leaf and season with the above herbs and spices, adding a little extra of whichever you like to taste. I personally adore the pinch of nutmeg in this soup but feel free to leave it out if it's just not your cup of tea! The soup is great both ways! Depending on the saltiness of your broth, you might skip the salt entirely or prefer to add a bit more. Taste and tweak as needed after adding your cheese. That extra broccoli you left on the side? Blanch in boiling water, steam in your microwave, or basically cook it however you'd like, then stir that green goodness into your completed soup for great texture and an extra burst of broccoli. Garnish with a little extra grated cheddar and a sprinkle of parsley and even a pinch of spicy red pepper flakes if you'd like! Anything goes! Feeling fancy? garnish with red pepper flakes, parsley, and extra sharp cheddar. To make this soup gluten-free you can use pureed potato to thicken the soup without using a flour-based roux or use sweet rice flour in place of all purpose flour. I’ve also used an all-purpose gluten-free flour blend in place of the conventional flour in the recipe with great results! Cheese-based soups and sauces are a bit tricky, since cheese has a borderline multiple personality. It starts out solid, begins to melt, then thickens, then [if temps are too high] jumps right back into solid territory by curdling. Best way to avoid that last little quirk? Use full fat dairy products for your cream base [they stand up to heat better than lowfat dairy], add your dairy products towards the end of the cooking process on a lower heat setting, and also combine sharp cheeses with creamy ones, for better melting and texture. I chose higher quality, full-fat cheeses to ensure maximum flavor and melting. The result? Pure creamy deliciousness! You’ll wind up with two BIG bowls of the stuff or four appetizer-sized portions to pair with sandwiches or salads. Ooh! It also reheats like. a. champ. And it’s freezer friendly! LOVE that! This sassy soup cooks up AMAZINGLY in the pressure cooker! It’s wicked fast too! Prep and measure your ingredients first. WITH ROUX: Set an electric instant pot to sauté function and make your roux. Next add broth, carrots, onion, garlic, broccoli, and seasoning as written in above recipe. Hit cancel/off to turn off your sauté function, then set IP to HIGH pressure for 5 minutes. Once it beeps, quick release the valve at the top of the pressure cooker. Add your half and half and freshly grated cheeses and stir until the cheese has melted into the soup. Enjoy! WITHOUT ROUX: You can also choose to skip the flour for a thinner but equally tasty broccoli and cheese soup that’s gloriously gluten-free. If skipping this step, quickly sauté your onion and garlic in the butter. Turn off sauté setting and add broth, carrots, broccoli, and seasoning as written in above recipe. Hit cancel/off to turn off your sauté function, then set IP to HIGH pressure for 5 minutes. Once it beeps, quick release the valve at the top of the pressure cooker. Add your half and half and freshly grated cheeses and stir until the cheese has melted into the soup. Enjoy! Comfort in a bowl! 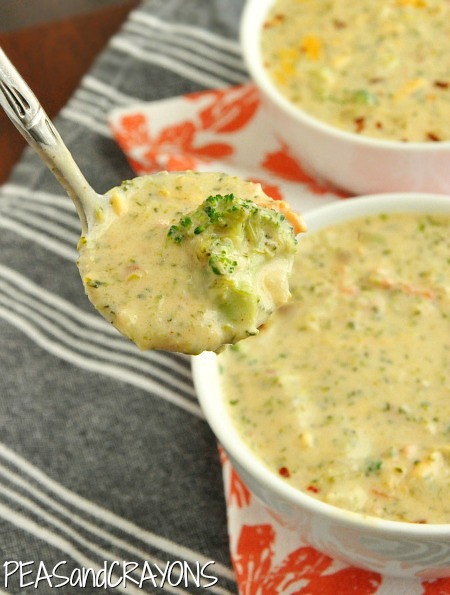 I’m hopelessly in love with this broccoli and cheese soup! Need to round this baby out into a full meal? Add a piping hot veggie and cheese panini or even serve up the soup in a bread bowl! Am I allowed to swoon now? I’m swooning. Considering this soup has over 870k pins on Pinterest currently, I think it’s safe to say you’re swooning too. Hope you adore this bowl of yum as much as we do! Panera has never been a go-to for me so I have to admit, I’ve never had it from there. Hubby absolutely loves it from there so knew I had to try it and he said side by side you’d never know the difference! I did leave out the ‘warm’ spices based on blog comments and reviews though. Initially I thought I’d have to use an immersion blender to get the consistency but nope it all blended down on its own. This is definitely a keeper! This has been my go-to Broccoli and Cheese soup recipe for a couple of years now and tonight I decided to make it in the Instant Pot. Game. Changer. So quick and easy and still as delicious as the stovetop method. Ultimate comfort food in minutes! Run, don’t walk to the kitchen and make this soup now! Jenn, thank you very much! I like this soup! Wonderful combination of ingredients. My favorite. Really easy to make and so tasty. Can this be made in advance (like, the day before) and then reheated? Also, this recipe makes two servings, but I was hoping to make enough for 10-12 people. Do I multiply the ingredients by 5? It sounds amazing! I really don’t want to screw this up, lol. Winner! This was yummy. We’ve tried several rounds of broccoli cheddar and this one got it right! This is the first we have made where we 1) are saving the (tiny bit) leftovers and 2) plan to make it again! Made it for lunch today and couldn’t stop eating!!! So delicious. My partner loved it too. It’s going to be a regular thing!! This soup is amazing! I came across this recipe while trying to find something to do with some excess Gouda, and even though I’m not a big broccoli fan (and that’s an understatement) decided to give it a try. This has become one of my favorite soups and I make it regularly. Thank you so much for a frankenfood free option! Better than Panera! Thanks for the recipe. I’ve been looking for a great broccoli cheese soup recipe and this one is it! I thinned it just a little with milk at the end and omitted the cayenne. It was a hit with the hubby and the baby. I shared it on my Friday Favorites blog post last week. This is the best soup ever. It’s so delicious and flavourful and easy to make. It’s also easy to eat the entire pot yourself in one sitting. Make this soup now. It’s comfort in a bowl! Yayyy! So glad you enjoyed it April, thank you! I just made this soup in the crockpot and it was amazing! The key to converting it to a crockpot recipe was this: cook veggies, spices and stock/broth on low for 4 hours. Then in a saucepan on the stove make a quick roux by melting butter, adding flour and then whisking milk and finally cheese. Then add this to the crockpot and it’s magic! I also added 1T constarch at the end mixed in cold water to thicken a bit. Thank you for the amazing recipe! It’s a keeper for sure! Very easy to make. Before serving I put a 1/2 t. of sherry in each bowl. Then topped with 1 T. of shredded cheddar cheese. Am I supposed to change the insta pot from sauté to pressure cook? Can I substitute the gouda cheese with swiss cheese? Hi Pat! Swiss melts great and as long as you’re a big fan of the flavor I would say totally try it out alongside the cheddar! LMK how it goes! My family loved it! My 2 and 5 year olds really enjoyed the bread & butter i served but woULD’nt we all! Would make it again for sure! Yay!!! I could legit marry this soup – super glad it was a hit! Hands down the best broccoli and cheese soup recipe I’ve made. Oh this looks soooo good and I was so excited to make this! I actually attempted this and I think I did something wrong because the soup tastes like spices, mostly nutmeg. I followed the measurements exactly but judt doubled the batch. I’m not sure what I did but I guess I added too much spice :(. So disappointed in myself! Hey Mia! You might be a wee bit sensitive to the taste of nutmeg? It can taste strong to some! I would add a little extra cheese and broth tomorrow after it sits in the fridge and that should dull the spice! I have friends that absolutely love nutmeg and ones that loathe it and skip it in any and all recipes, so don’t feel bad whatsoever! Love this! Have made it several times. I am currently making this soup for the fifth time and I love it! Its always a hit, and you can pretty much throw any veggie in and its still delicious. The one thats simmering away one the stove now has shredded zucchini and red onion instead of white, in addition to the broccoli and carrots! My only complaint is that there is never enough soup! I sometimes triple this delicious, nutrient-rich recipe! So yum! I did! It wasn’t my favorite method for a cheese based soup. The cheese almost always curdled and the broccoli always got too too soft. Stovetop is hands-down my favorite prep method for this particular soup. To make it super speedy, you can even prep all your veggies ahead of time [chop and measure] a day or two in advance and then it comes together so fast as a weeknight meal! I have made this many times for me and my adult children. We all love love love it!! Loved it! Made this recipe for dinner and my family and I devoured it. It is definitely a recipe to leave in the books in our home! I came back to tell you how !much I loved this soup but since I had to scroll past a few hundred raving fan posts I suppose you already know. I will be adding this to my regulars. I served it with a side of cornbread. Thanks for sharing the recipe! I’ve been eyeing up this recipe for too long. A sale on broccoli + freezing rain…I think it’s destined to happen soon! WOW this is delicious! I only had fat free 1/2 & 1/2 and low fat sharp cheddar – those were the only substitutions i made. Love it! Hubby just called and is going to be late. Hope I don’t eat the whole pan before he gets home. Found this recipe on Pinterest. Turned out yummy! Used beef broth instead of chicken. Hi Jenn…..made this soup this afternoon and it is delicious (haven’t served it yet but had to have a taste!) we will have it soon while we watch football playoffs. I used 1% milk instead of 1/2 and 1/2 (just to try and be skinny!) and closer to 3 cups of chicken broth, also added 1/4 cup white wine, just cuz wine in soup is always delicious adds another layer of flavor. It still has a thick consistency even though I used milk, added a little extra flour to help thicken it a bit. Thanks so much for the recipe, we love soup, try a new one every Sunday in the winters! I guess to make this soup gluten free, I would thicken it with corn starch, sound really delish, Thank you! Hey Ann! That should work just fine! =) I’ve also heard potato starch works too. Hope you love the soup as much as I do! Tasted wonderful!!! Added extra veggies, and used veg. stock and rice flour to make it gluten free, like you suggested. Many thanks!! Chop your broccoli stalk up nice and small and put it in too! I always use my broccoli stalk for soups if I’ve just eaten the pretty florets, it helps limit your waste and it’s tasty, just doesn’t look as yummers. Why do recipes always tell us to remove the stalk?! I think because I’m used to my family and friends not being very fond of them? At least for me that’s what it is! I dip my broccoli stalks in dressing, use them in slaw, or juice it with a medley of fruit and veggies! =) I feel you though, I despise waste and try to get the most from anything I bring home! I made this tonight, and substituted cornstarch for flour to make it gluten free – it was YUMMY!!! Thanks for a new family favorite!! I made this Saturday and it was great. Tonight I gently warmed it up for supper but it separated and was watery and gloppy. Still tasted ok but no longer the right consistency. I also substituted the Gouda with Fontina. What happened??? I too doubled the recipe so I’m hoping the soup isn’t ruined. Looking forward to hearing your thoughts. Thanks Tiffany!!!! Fontina is so rich and buttery yum!!!! It must have been a great addition! I’m happy you enjoyed it too! Opps! Forgot to rate! Sorry! Thanks so much Christa!!! Too many veggies? haha nevahhh! So glad you loved the soup! Just made this for a day filled with scrapbooking! It is so yummy!!! I found the 2 cups of stock wasn’t enough though. Just added more and it was fine! Maybe I added too many veggies? LOL! Thank you for the wonderful recipe! I have definitely pinned this one and will use it over and over again! Oh my goodness this is AMAZEBALLS!! Broc and cheese is my favorite soup but I’ve always been scared to make it. This was so simple and so down home tasting. I finished mine off with a couple of slices of rosemary bread. This will carry me through the winter. Thanks for sharing! Thank you for sharing this recipe. It was AMAZING. My husband loved it. He said it was the best broccoli cheese soup he’s ever had. It is definitely a recipe I will keep! Woot!!!! So glad you both approved! <3 Thanks Brittani!! Just made this for dinner – it was incredible! I used Greek yogurt instead of the half and half and it turned out great. Can’t wait to eat leftovers for lunch tomorrow 🙂 thanks for sharing! Oh. My. Gosh!!! Amazing!!! I made this last night and we loved it! My husband even went back for seconds! I added mushrooms to mine and it tastes amazing! I was also happy to see I could substitute regular flour for rice flour to make it GF for my hubby!! Im curious, do you think you could substitute the Goida for Havarti? I think I may try it that way next time! Yay!!! So glad you both loved it! The addition of mushrooms is brilliant- I have to try that! Havarti will work as will Gruyere! Both tend to be on the softer/meltier side so they will make an excellent addition! So good! Panera is my favorite and this soup is as close as you can get to theirs, but better because 1) it’s homemade 2)you can make a huge batch without spending a small fortune. I just made this, I am a college student who loves broccoli and cheese soup. I wanted to make something that I had majority of the ingredients for and this fit the piece. I would like to say this…this was the best version I have ever had! This was my first time making a soup in general and wow! Great directions, ingredients, and overall just awesome! I will be passing this on to my Grandmother and Mother. Great recipe good job! Can I Use Evaporated Milk Instead OF The Half And Half? And What If I Were Using Frozen Broccoli Instead Of Freash? So I see that it makes about 4cups but I am wanting to make it for about 12 people. Are there any adjustments that I should make to the recipe or just triple everything? I found you through pinterest and decided to give your recipe a try and WOW!! I just made this for dinner tonight and it is amazing! I’ve never had the panera version (they don’t have those where I live, sadly), but this soup is impressive! I also love that it is vegetarian! I try to cook vegetarian meals at least 3 times a week to help cut down on cost of groceries, and this is is such an amazing dish! My husband (a carnivore) didn’t even miss the meat. This will be going into our dinner rotation! Thank you so much for posting this! Just made this soup and it’s AMMMMMAZING ! I can’t believe I spent so much money at Panera Bread ! I could of been making this years ago ! Thank You !! Just made this soup for myself…errr I mean my family ; ) and I LOVE IT! Super easy to make (even with grading the cheese yourself). My husband (worlds biggest critic when it comes to my cooking) and my 1 year old son gobbled it up (as well as myself)! This is definitely going to be my go-to comfort food soup AND I am planning on making it again when I have an all girls night at my house next month. Thanks! I look forward to perusing your site for more delish recipes! I believe so! Lost sources suggest sweet rice flour to thicken a soup via GF roux: http://mobile.seriouseats.com/recipes/2011/01/gluten-free-tuesday-roux-rice-flour.html — as for the crockpot, I would skip it. Sometimes heating delicate cheeses for that long will result in grainy or curdled chunks in the soup. I’ve tried it both ways and prefer stovetop. also want to know if this works in a crock pot? Can I do this with gluten free flour? I made this for a work function. I made it the night before and then in the morning poured it into the crockpot and it heated up nicely, Just make sure to heat up on low. It was so yummy, will be making again soon! Always love a good soup recipie. I have a point of conern, though. I’m allergic to carrots–I can’t even handle them without getting hives. How nessicary are they to this recipie? Could I substitute another veggie? Use more broccoli? Grate the stem? I just made this and it really is AMAZING. I quadrupled the recipe as I have 2 teen boys and a 10 year old girl who can out-eat them! WOWOWOWOW Make this soup. HO.LY. COW. This is literally the best broccoli cheese soup I’ve ever had. I’m adding this to my personal cookbook right now! I’m new to gluten free cooking. Would you add the potato puree to the broth and vegetables to thicken it and omit the flour/butter steps? Can’t wait to try it out this weekend, even though it’s still warm my 7 year old insists it isn’t fall until I start making soup and broccoli cheddar is her favorite! I made this tonight, adding extra milk and a few more Spices because I added chicken and more broccoli – it’s absolutely delicious. Thank You! how many servings does this make? Im planning on making it tomorrow for a family of 7. Hey, I made this soup once in the Spring, and then again for supper tonight. It’s super delicious. I definitely don’t need to try any other broccoli cheese soup recipes. This is THE ONE! Props to Pinterest for leading me here, and of course to you Jenn. Good work! is this something you could make in the crockpot? or does it have to be done on the stove? Hi Jen! I used all natural “Kitchen Basics” chicken cooking stock and the box states that there is “no msg”. You may want to try this brand of chicken stock (if you can find it in your local grocery store), if you are not making your own. Yes!!! “Fixing something to eat” vs actual cooking us a fabulous way to put it! Way to rock the healthy lifestyle changes and whole foods! You’re awesome! Just walked away from the table after serving this to my husband and two kids. Everyone loved it! Thank you so much for this recipe! loved it, thanks! you really can stop searching everyone! this is it! 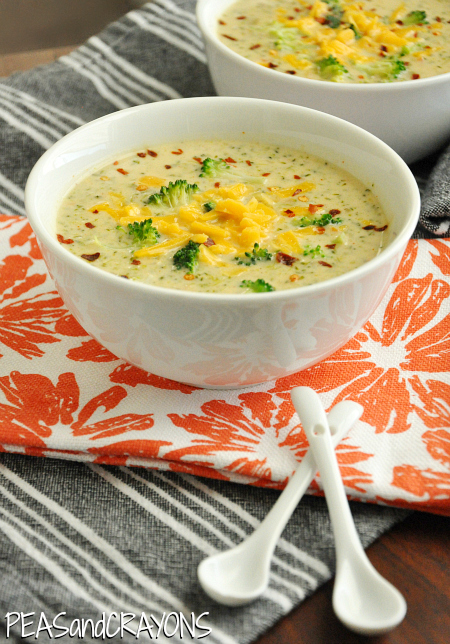 this is the broccoli cheese soup you’ve been looking for! Could you use evaporated milk in place of the half n half? Thanks for this awesome recipe, I will definitely be making this again and again!!!! OMG!!!! This sounds WONDERFUL! and yes, I have seen those bazillions of recipes with Velveeta–YUCK! Thank you for this “healthy real food” soup recipe. Totally agree with all you wrote about Panera–they truly “give back to the community” and it is my favorite place to meet friends and have breakfast or lunch. You walk in and smell that wonderful bread–what’s not to like? Thank you!!!! I HATE frankenfoods!! ‘Cream of’ anything canned is disgusting. In any recipe using them, I say it’s not cooking. It’s ‘fixing something to eat.’ And I’m against low fat products. I’ve taken 70lbs off by eating REAL food. I will DEF make this. I am so ready to try this!!. Didn’t know broccoli could be this good! Leftovers for lunch today were just as delicious. You and your soup ROCK! Thanks!!!! So happy you liked it! I can’t wait for cooler temps so I have an excuse to make this one more often =) I’m a bit obsessed! OMeffinG!! Best broccoli cheese soup ever! Used smoked Gouda. And the recipe is already perfectly creamy; no additional flour necessary. Looks so good! Can’t wait to try. Huge THANK YOU for adding the gluten free option to the recipe! This is by far, hands down, THE best broccoli and cheese soup I have ever tasted. My husband does not like soup and he couldn’t get enough of it! This might be the first soup I make without the aide of my crockpot, it just looks so dang good! I just tried Panera’s broccoli cheese soup the other day and loved it. Having grown up on my mom’s, I found others bland and pasty. Your recipe looks so good and I love the fresh ingredients. Can’t wait to try it! Could I use carrot pulp that is leftover from juicing in place of the shredded carrots? I cannot WAIT to try this when it cools down again! My hubby and I were just talking about winter soups, stews, and chowders a few minutes ago… Then I get on Pinterest and see this! Perfect timing! 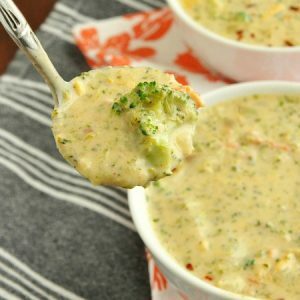 I absolutely LOVE broccoli & cheese soup, but I’m dairy free and haven’t had any in soooo long. Do you think goat cheese would totally ruin this if I used that instead? Thanks! I’ll give it a go when I get a chance and let you know the results! I just made this and my husband and I both loved it! I cook so much that I’m not big on following recipes, but I’m so glad I did! Thanks for making it worth my time! Oh my! Just made this for supper and the family loved it! Thanks! Thank you so much!!! It came out to 9 pages (I printed 7 of them). I can live with that. I can hardly wait to try this soup! I really want to keep your recipe in my recipe box, but when I go to print it, it’s 23 pages long, the pictures are scattered as well as the paragraphs. Is there any way you can put up a link just for the recipe w/o pics or comments? 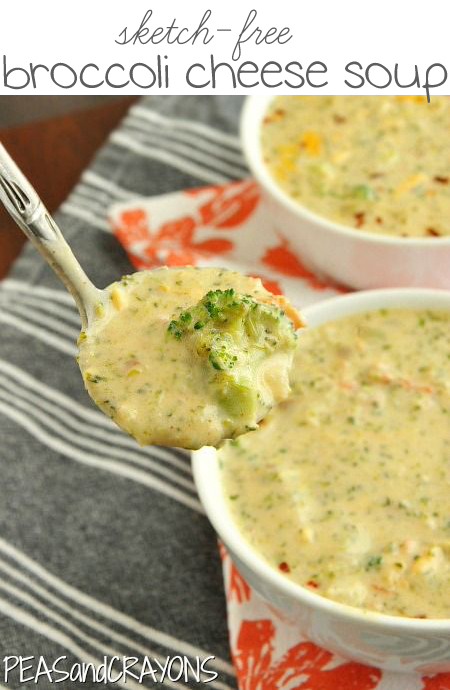 I love broccoli and cheddar soup and can hardly wait to try this. Just made this now. Super easy and a great way to get veggies into our diets that we don’t normally eat! I made it using thickened cream this time, but I would prefer something with a bit less fat and less rich. Would sour cream or 0% milk work better? Thanks, I might buy a bottle of low fat milk instead and try that! Thanks Angela! =) I’m glad the recipe worked marvelously with what you had on hand! Any recipe that can do that stays in rotation here forever since I’m always out of SOMETHING! hehe =) So excited this soup got a thumbs up from the veggie-wary husband too! I made this very american soup for my family tonight and we absolutely loved it. It is the first time my boys had broccoli cheese soup and my 1.5 year old cleaned his bowl just couldn’t get enough. I’m so excited your family loved the soup! And a toddler approval? That’s the best ever! Thanks! I don’t know how I came here (probably from pinterest) but I’m so glad I did. I made this soup today and it was seriously GOOD! I have to admit that I had a bit of bacon that needed using so I cut it up, cooked it, and made the roux (not sure of the spelling) on top of that. It was a lovely and tasty addition. But even without the bacon this is the best broccoli/cheese soup I’ve ever made. Guess now I’ll have to look at your other recipes! Hey there! Any idea if this will freeze and reheat well? I’m pregnant and want to freeze some yummy meals for post-babybirthin’. Not a problem at all. I will direct my faithful (few;) followers to your blog for the recipe. I didn’t know you were doing a cookbook. That’s exciting, congrats! Thanks again for the great recipe! Hey there, Jenn! 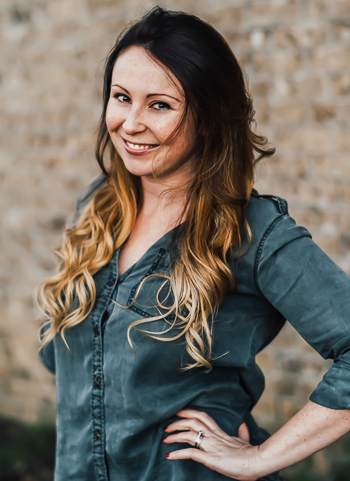 Just wanted to let you know the post is live. You (and others) can check it out at http://highhopesandheartbreak.blogspot.com/. It’s the first post right now, but in the future, it’ll be in the “Cookin’ in the Kitchen” tab. Bear in mind, my pics are simply from my iPhone, so yours are much better. 🙂 I’m eating the soup right now, so I couldn’t be happier. Have a good weekend! Ahhhh I love it! Tweeting it and adding it to my Pinterest boards so everyone can check it out! <3 Thanks Renee! Can you tell me how much this recipe makes? I feed a family of 6 and I was thinking I should probably double the recipe. I absolutely love, love, love this recipe.. I love broccoli cheese soup, and only eat it if I go out and its available.. Pre-packages soups are too salty, even the dry mix kind.. I have been doing a lot of cooking from scratch of all the things I love to eat. And this by far will need to be tripled the next time for me and my son.. We ate some for dinner but I immediately scooped out some for lunch the next day. We ate it with french bread.. I of course made a thicker soup with the added butter and flour, amazing, and more veggie, because I got shred happy with the carrots and broccoli.. I did not use the bay leaf, & cayenne pepper..I also used a low sodium vegetable stock, white cheddar cheese and swiss cheese. So good next time i will use the gouda. Thanks for the recipe again it is the BOMB. Yea, ok this was absolutely delicious!! I didn’t want to spend the money for the gouda and I just substituted Sharp cheddar and it was still just as delicious! That was delicious, thank you. I am usually not a huge soup fan but this recipe looked so tasty that I had to try it and I will definitely be making it again! This soup looks great and I am definitely pinning it….probably for a day I am home alone, because I want it all to myself! I do have a silly question- where did you get those little tiny soup spoons! They are so cute! You can also substitute corn starch for flour. To make gluten free.. This soup also freezes well.. I used 1% milk and only 1/2 cup of cheddar and it was de-lish. We ate this tonight. The second recipe of yours we’ve tried. Everytime I make one of your meals, my boys and husband rave over dinner and say it’s the best thing ever. I think I’ll just make a grocery list from your website from now on! Made this tonight for my roommates and I and it was very well received! I didn’t have any cayenne pepper but you couldn’t tell that anything was missing. Thanks for a great recipe! Just made the soup, used frozen veggies b/c i had then on hand. Oh boy is this amazing live it. I’ve shared with my while family your site! Can I just confess— I have been changing the way I eat for a year now. I’ve been in a funk because we challenged ourselves to not eating out for a month. I am very irritable. I feel like it’s all work and no play for me. Then I saw your post with the delicious looking, non-synthetic ingredients, and I realized it will be okay. Made this tonight! It was GREAT! Thanks so much for the recipe! We will be having this again! I followed the recipe exactly minus the allspice, since I didn’t have any. Let me say that this is the best soup ever. It is such a fresh soup that doesn’t feel really heavy. I stress this since I used whipping cream instead of half and half. Thank you for sharing this recipe. This is a soup that will be recurring in our household. I made this today and I can’t get enough (although I need to, because, let’s face it, this isn’t good on the waistline :))! It’s THE best broccoli and cheese soup I’ve ever made. Thanks so much! My entire family loved this! Thank you! Just made this soup. I saw it pinned on pintrest and pinned it myself. The soup is AMAZING!! Just made this and I absolutely love it! Better than Panera Bread! Just made this but had to adjust a few things because of what I had available. My cheeses were 1 cup gouda, 1/2 cup parmesan, and 1 1/2 cup cheddar. I also used 2% instead of cream and the soup overall was awesome!! So happy it works with low-fat milk! eee! Thanks! Thanks for the gluten free adaptation! Panera’s broccoli cheese soup is what I miss most! You’re super welcome! Hope you love it! I do love that they donate and they serve whole foods… which, to me, still beats the pants off the franken-nuggets made with pink slime and taco shells laced with silica and weird additives. Though I completely understand that no restaurant can ever truly compete with homemade and hand-picked, especially for those of us with dietary restrictions, intolerances, and other such needs. However sometimes in life you’re eating socially with friends or co-workers or just need an option outside the home, and I would always prefer a Panera greek salad and baguette over a greasy fast food burger and fries. I do value and appreciate your comment though and will keep an eye out for any such research that comes my way. Thanks so much for stopping by Angela! yum! A trick to melting the cheese. Boil water (or broth), tbsp butter, shredded cheese & a couple tsp corn starch. this allows the cheese to melt but not separate. Living in Japan we don’t have PB down the road anymore…I LOVE their soup! I have been looking for a recipe without “canned cream of anything” and Fake cheese! Can not wait to try this recipe! I have been searching high and low for a broc/cheese soup recipe that does not have “canned cream of anything” or FAKE cheese!! Thank you so much…PB is my favorite, but living in Japan there are none around…lol! I can not wait to try this recipe!! I really want to try this recipe, but i really dont like gouda..any ideas? This looks absolutely divine! I want to jump in a bowl of it right now! I saw this and had to have it. I made it last night and it was SO delicious! I could only find smoked gouda in my store; is that what you used? Next time I would do equal parts chedder and gouda and omit the extra salt. Thanks for the great recipe! Haha then he clearly needs this soup! Stat! =) Thanks Claire! I want some. Now. Come and make it for me and the Peanut and I’ll let you swing dance with J. This is my favorite soup from Panera too! I am so happy/excited/giddy to try this because I know its legit! I have never attempted homemade broccoli cheddar soup becasue all the recipes have nasty-fakeness (word? )going on! YUM thank you!!!!! Yes! Down with fakeness! Thanks Colby! Since I made your cauliflower asparagus pesto soup last weekend, and it didn’t disappoint, I think I’m going to have try your broccoli cheddar soup this weekend. I LOVE Panera’s BC soup but then I gave up meat (silly girl), and it turns out they make it with chicken stock. So whenever we go, I shoot dagger eyes at the Hubby across the table as he slurps up my once favorite soup. Hope you have a great weekend. P.S. Love the name; it’s right up my alley, in a non-skethcy way. I die. This totally made my day Meghan! When I was recipe testing I tried the saute method and it totally worked, but his worked almost identically AND was easier/less messy. I about swooned into the pot and I’m over the flipping moon that you loved it too! I made your Broccoli Cheese soup last night, and at first, I was concerned. Typically when I make soup, I saute my veggies in a little oil first, then add the liquid component (i.e. veggie stock), but that wasn’t the case here. Your recipe has it all going into the pot together. Not gonna lie, I was nervous, but I decided to just trust you (this is big for me) and follow your recipe as written. I’m glad I did because I can vouch for it. It was soooo good, creamy, cheesy, and delicious. The only thing I can’t vouch for is whether it’s good when reheated because there weren’t any leftovers. Both the Hubby and I went back for seconds. You are da BOMB. Ohhhh…… I have to try making that!! It’s beyond easy! Hope you love it! um. DROOL. 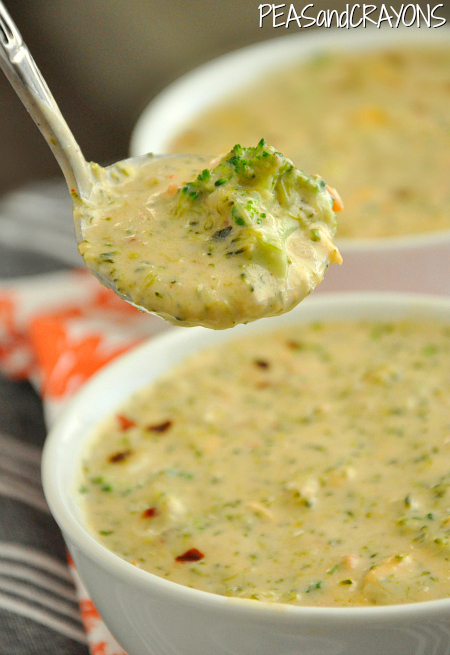 i love panera’s broccoli and cheddar soup so i’m definitely going to make this soon! That looks like the perfect, hearty sopa to have for dinner on this cold night! Slirpy, slirpy, nom! oh french onion… I love that soup too!